Marley has a home! - Rocky Mountain Great Dane Rescue, Inc. This sweet girl has stayed at home with her new foster family Mike & Lori. 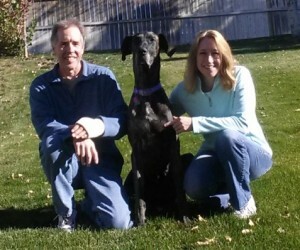 This family have an immense amount of Great Dane experience and had recently lost their Danes. This girl came into their lives and filled the hole that had been left in their hearts! Way to go Marley!